The main span of the Sutong Bridge across the Yangtze River was completed yesterday. With a span of 1,088-m, Sutong takes over from Japan's 890-m Tatara Bridge as the world's longest cable-stayed bridge. It also holds a number of lesser records. 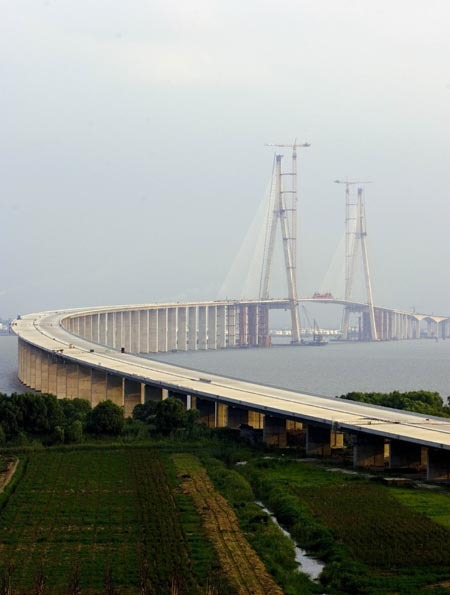 The 6.45-billion-yuan ($845 million) bridge, which links Suzhou and Nantong, two of the main cities in Jiangsu Province, is expected to have a far-reaching economic impact on the affluent region. "The project has gone through a host of extremely tough technical challenges," Sun Jun, a bridge expert and member of the Chinese Academy of Sciences, said yesterday at a special ceremony. "It is not only a milestone in China's bridge-building history, but also representative of state-of-the-art bridge construction technology." Besides its huge span, Sutong boasts the world's two tallest towers at 300.4 m, about the same as a 100-story building - compared with those for the Tatara Bridge, which measure 224 m. The towers sit on the world's largest pier base, which is about the size of a football pitch and is anchored 80 m into the riverbed. Hundreds of steel cables attach the bridge deck to the two towers to help it withstand heavy winds traveling up the Yangtze. The longest cable, which is the longest single stayed-cable in the world, runs 577 m, 100 m further than its equivalent on the Tatara. Shanghai's Bao Steel provided the steel for the cables and this was the first time a major bridge in China has used cables by domestic steel-makers. Ole Rud Hansen, project manager with Cowi A/S, a Danish firm consulting on the bridge's construction management, said: "This is a great project of international quality. China should take pride in it because it is Chinese design, Chinese engineering, and Chinese management.